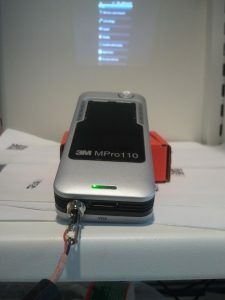 Wanted to report on some progress I made connecting the Samsung Galaxy S Vibrat smartphone and a 3M MPro110 pico (pocket) projector. It is a fairly simple process, but I couldn't really find any schematics of the video ports on either the phone (the 3.5mm headphones jack) or the projector (3.5mm composite video-in jack). So if anyone is trying to do this, they can find the wiring schematics here. 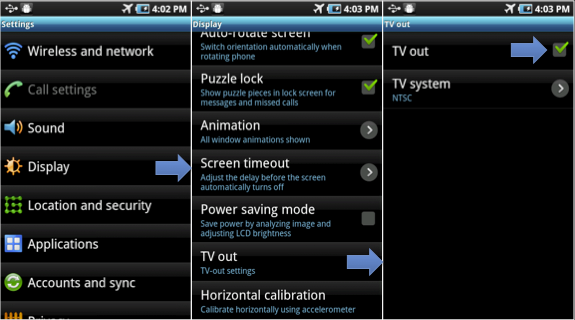 So, on the phone side, the 3.5mm headphones jack also gives out PAL/NTSC TV signal if it is enabled in the system menu. A 3.5mm headphones jack with 4-poles is a.k.a TRRS: Tip, Ring, Ring, Sleeve. Now, prepare a custom 3.5mm 4-pole connector, and solder a 4-wire cable to it. I used my own convention with the colors: Audio is Red and Yellow, TV is Green, and Ground is Black. On the MPro110 projector side, I found out they only have a 2-connector 3.5mm jack for the composite video in. But - and here's the scoop - the GND is not the sleeve, but the tip, and the TV signal goes on the sleeve. Confusing... But I can understand why they do that. They want people to use their own accessory cables and not generic ones, so they flip the positions and render all generic cables obsolete. Anyway, so on the other side of your custom cable, you may use a mono 3.5mm 2-connector plug because that is all you need, but if you bought bulk 3.5 4-connector you might as well use that. Now you should mind that you need the sleeve to get the signal, so connect Vibrant's Green to MPro110's Green, Yellow and Black. MPro110's Red, the tip, should go to GND. Vibrant's screen should show up on MPro110's projection.